High Quality: Heavy duty genuine leather steering cover,this design is highlighted by the contrast textures, creates a stylish, elegant style. 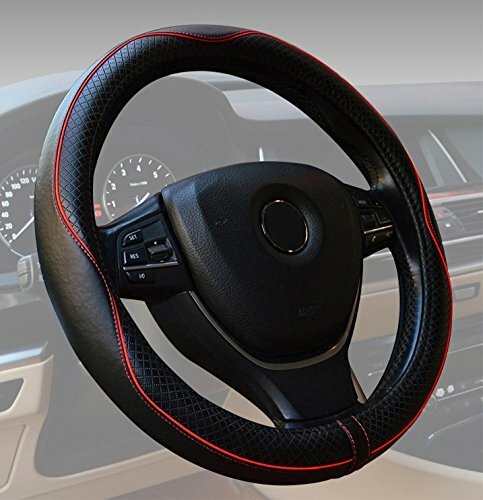 Steering wheel covers with environmentally friendly rubber inner ring, anti-skid lines, to prevent the steering wheel sets of mobile. For standard size 14.5-15 inch diameter steering wheel. Steering wheel cover for women, men and so on. High-grade leather embossed stitching technology, good ventilation. Feel Comfortable. Add some style to your vehicle with a new steering wheel cover.